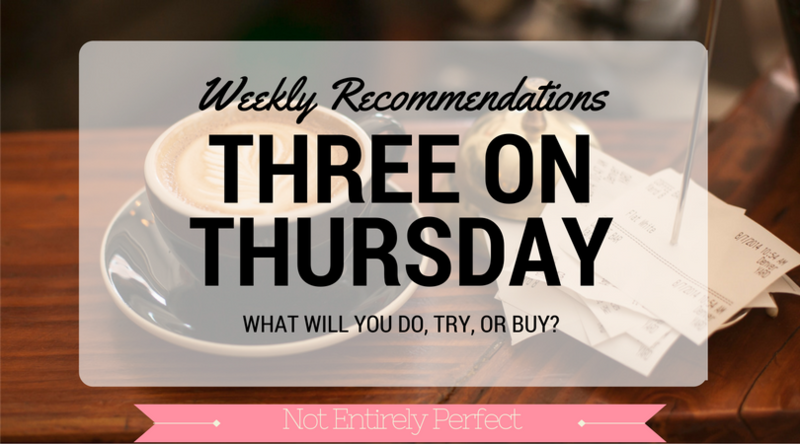 Welcome back to Three on Thursday, my weekly even though I sometimes skip weeks list of things I'm loving at the moment that I think you should do, try, or buy. If you're interested in past weeks, you can find those here. I haven't really thought yet about what I want to do for these this year, whether I want to keep going with the 3 things each week (or, most weeks) or if I just want to do the long monthly list of everything I loved that month. I was trying to avoid that since that's what everyone else does and I hate to bore you, but maybe it's easier to track that way. I'd fill the other Thursdays with something else, and although the something else is a mystery still, I'm leaning towards a monthly finances recap one week and maybe a monthly/weekly vlog another week. And probably a check in on my all my goals the last week. What would you prefer? Three on Thursday every week or a monthly round up of favorites instead? Tell me in the comments, majority wins like the way democracy is supposed to work. 1. 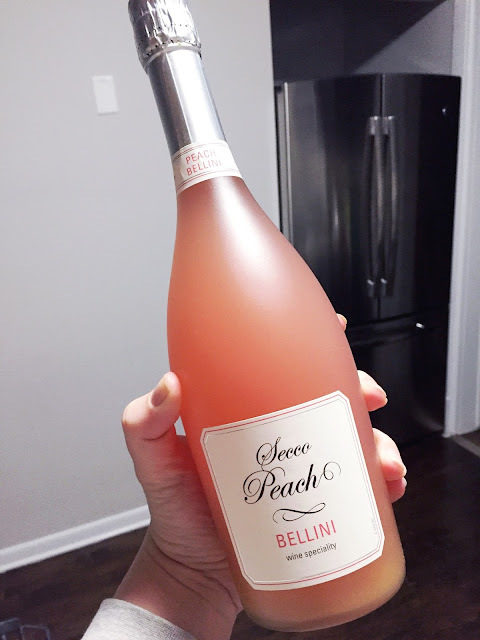 Trader Joe's Secco Peach Bellini. I almost forgot how good this is. My cousin served it at her engagement party this summer and she said it was from Trader Joe's, so my mom bought me a bottle for Christmas. Which I drank on New Year's Eve and it's so good. And it's only like $6, so you lose nothing by trying it. It's just like it says, pre-mixed peach bellini, but it's really tasty. I normally don't like pre-mixed anything because the flavor is off or it's not enough alcohol to the flavoring, but this one is good. It's not too sweet, either, you get a good amount of tartness with it. Don't get me wrong, it's a girly drink for sure. But one of my favorites. I need more bottles and so do you. 2. Detoxing from aluminum deodorant. If it's something you want to do, now is the time. Because you sweat less in winter, and your armpits are covered so it's an extra layer of protection. Aluminum deodorant, which, if you buy it at a drugstore or Target and it's not Tom's, yours most likely is, is really bad for you. It's linked to breast cancer more and more and sure there's studies that say the opposite but do you want to take a chance? Aluminum deodorant, at the very least, stops you from sweating. That's not normal, your body needs to sweat. There's a couple aluminum free deodorants out there, like the Tom's, or the Lavanilla is super popular (and freaking pricey). There's also recipes online to make your own. When you switch to these, there IS a detox period (shorten it by wiping your underarms with diluted apple cider vinegar throughout the day!) Whenever you switch away from the commercial stuff, there will be a detox. But it's just 2 weeks and now is the best time to do it by far. To detox, I went with the Lavanilla original and now that the 2 weeks is over and I've adjusted, I'm making my own spray with just 2 ingredients - pink salt and bentonite clay. Well, and water. (I don't want to make my own with coconut oil because that can leave oil stains on your clothes, and baking soda can be rough on sensitive skin, which I have.) Easy peasy, good for you, good for the environment. Maybe not for everyone, but it is on my 2017 goals list to cut out more chemicals. So it's either something you want to do or don't care about at all, I can't change your mind on that. But if you DO want to do something about it, I'm just saying now is the time. I've pinned loads of DIY recipes on my Zero Waste Pinterest page, if you need. 3. My new bar cart. Which I almost forgot to mention until I was reminded of the the peach bellini that rested on it ever so briefly. John got me a really nice bar cart for Christmas. The price was a steal because it's from overstock.com. The exact model is currently out of stock but they have a lot of good ones! I love that it's on wheels and the dark wood looks great in our dining room. 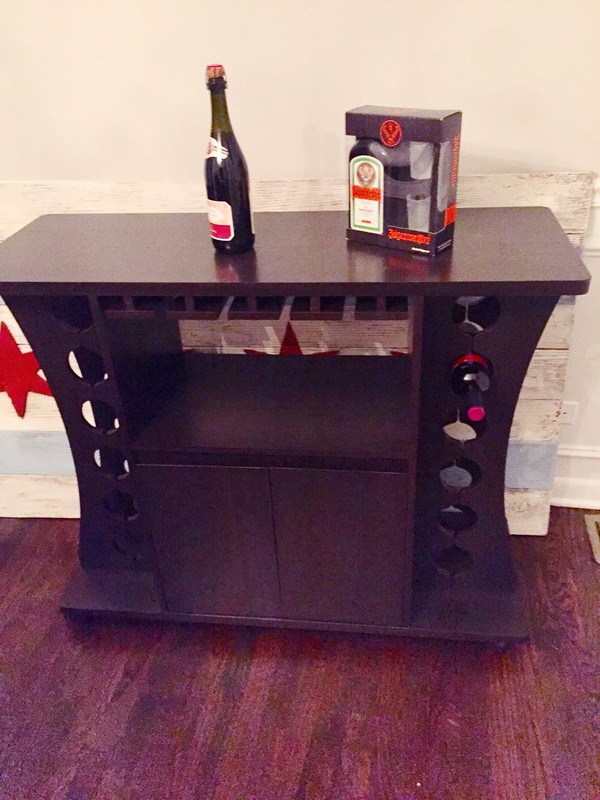 It has tons of room for bottles and hanging stemware, and a cabinet underneath for more storage. And it's actually pretty solid wood on the top and bottom pieces, which we were not expecting. I will say this - it was a little devil to put together. The instructions said 3 out of 5 difficultly, which wtf is 5 out of 5 then?? A rocket ship with instructions totally in Japanese? Nonsense. To be fair, since John doesn't read this blog, it would have gone smoother if I had helped from the beginning because boys don't read directions and he did parts wrong that needed re-doing. Without that, it would have been a little easier. Basically if you've put together Ikea furniture, you'll be okay, so I recommend that site for sure if you're looking for a new piece.